The Hon. 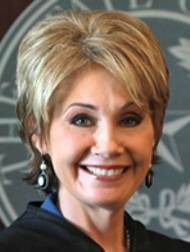 Debra Lehrmann, District Judge of the 360th Judicial District in Fort Worth, Texas, has served as a judge in Tarrant County for over 22 years. A member of Phi Beta Kappa, Judge Lehrmann graduated with high honors from the University of Texas in 1979 and the University of Texas School of Law in 1982. Prior to her appointment to the bench, she practiced law with the Fort Worth law firm of Law, Snakard & Gambill. She also worked as the Lead Attorney and Director of the Enforcement Division of the Tarrant County Domestic Relations Office. In 1990, she was recognized as the Outstanding Young Lawyer of Tarrant County. The 360th District Court is a general jurisdiction court that is charged with the duty to give priority to family law cases, including those filed by the Texas Department of Family and Protective Services. Presiding over this type of court requires a broad understanding of all types of matters handled by civil courts. Contested issues involve complex property, real estate, corporate law, mergers and acquisitions, intellectual property, trusts, oil and gas, tax, torts, constitutional law, domestic violence and child protection. A strong grasp of civil procedure and evidence is also required, as many cases are tried to both the bench and the jury. The caseload of the Texas Supreme Court involves increasingly large numbers of children and families who are the subjects of litigation. The election of Judge Lehrmann fulfills the need for a jurist experienced with the intricacies of these cases. Judge Lehrmann has been involved with the creation and implementation of the Texas Supreme Court’s Permanent Commission for Children, Youth and Families for the past several years. She currently serves on a committee dealing with the court‐appointed representation of children in abuse and neglect cases through the commission. Judge Lehrmann has been an active leader within the legal profession for many years. She is a past president of the Texas Chapter of the Association of Family and Conciliation Courts (AFCC), is a past president of the Tarrant County Young Lawyers Association, is a master member of the Eldon B. Mahon Inn of Court, served on the Advisory Board of Tarrant County Dispute Resolution Services, is a fellow of the Texas Bar Foundation and the American Bar Foundation, and is a charter member of the Tarrant County Bar Foundation. Judge Lehrmann actively participates in the national legal community as well. She currently serves as the Chair‐Elect the Family Law Section of the American Bar Association (ABA/FLS). She also serves as the Section’s liaison to the Judicial Division of the ABA. She is a past member of the Executive Committee of the Section Officer’s Conference (SOC) of the ABA. In 2003, she was appointed by Governor Rick Perry to represent Texas as a Uniform Law Commissioner. As part of the Texas delegation to the Uniform Law Commission, Judge Lehrmann participates in the study and drafting of uniform acts that harmonize and bring efficiency and predictability to vital areas of interstate interaction. Over the past six years, Judge Lehrmann has participated in revisions of the Uniform Commercial Code, Uniform Probate Code, and Uniform Trust Code. Additionally, she served as the Chair of the ULC drafting committee on the Uniform Relocation of Children Act and on the committee which created a uniform law on the court appointed representation of children. This experience affords Judge Lehrmann invaluable insight into national legal issues and the interplay between judicial, legislative, and practical issues. As part of her dedication to the practice of law and training of lawyers, she speaks frequently at continuing legal education events throughout the state and country, and is a regular lecturer at Texas Wesleyan School of Law. She authors two legal treatises which are updated yearly, Texas Annotated Family Code (Lexis Nexis‐Matthew Bender) and Court Appointed Representation of Children in Texas Family Law Cases—A Practical Guide (Lexis Nexis‐Matthew Bender). The author of numerous published articles, in 2003 she received the Texas Bar Foundation’s award for the best bar journal article of the year, for The Child’s Voice An Analysis of the Methodology Used To Involve Children in Custody Litigation” (Texas Bar Journal, November 2002). In 2005, Judge Lehrmann received the Court Appointed Special Advocates (CASA) Scott Moore Award as recognition for her service in the judiciary. Most recently, in December of 2009, she received the prestigious Judge Eva Barnes Award for dedication and outstanding service to the legal profession. As an experienced judge who has been recognized for exemplary service, with a well‐rounded professional background, she is ready to bring a fair and sound voice to the court.